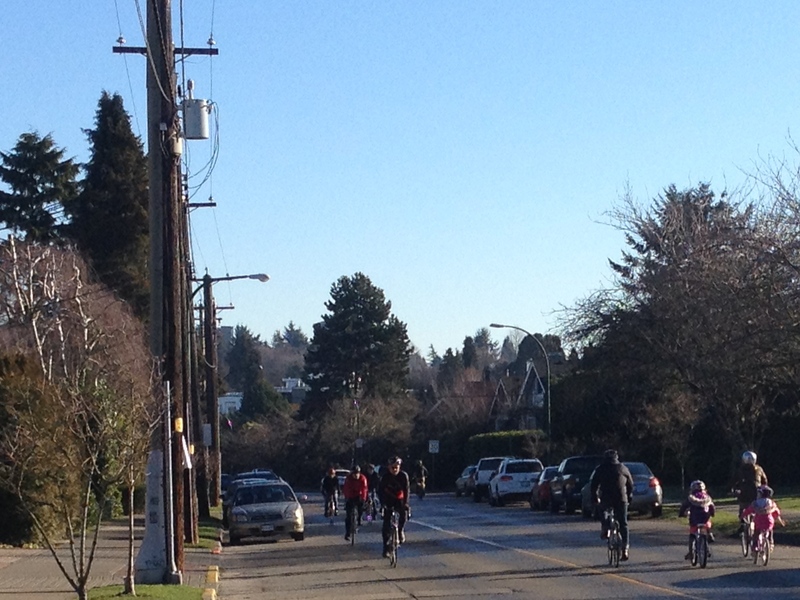 Even with the construction not complete, lots of people are enjoying cycling, walking and jogging along Point Grey Road giving us a small glimpse of what it will be like this summer once the separated bike lane is completed along Point Grey Road between Trafalger and Macdonald. As was the case with Burrard Bridge, Hornby Street and Dunsmuir, the traffic chaos that some predicted just did not happen. The Burrard Cornwall intersection cycling and walking improvements are almost completed with only the bike path on the west side of Burrard left to pave. The York Bikeway is under construction and construction on the separated bike lane along Point Grey east of Macdonald should begin soon. Be careful if you check it out as there is active construction. Without the speeding traffic, the birds, bikes and joggers now are just so noisy now! A good idea to send a quick thank you to city council mayorandcouncil@vancouver.ca thanking them and staff for the improvements to the Seaside Greenway.